Who doesn't love a dessert that's healthy, yummy, and looks impressive on the table? These grilled peaches are guaranteed to deliver! Known for their mild sweetness, peaches are rich in zinc, phosphorus, and vitamins A and C for healthy eyes, bones, and immunity. Lucuma used in the cashew cream that crowns the peaches is a South American fruit appreciated for its low glycemic index and unique flavor. Topped with pistachios, which offer a good dose of protein, fiber, and healthy fats, these grilled peaches are a healthy dessert to remember. You can easily modify this recipe to include the ingredients you have on hand. 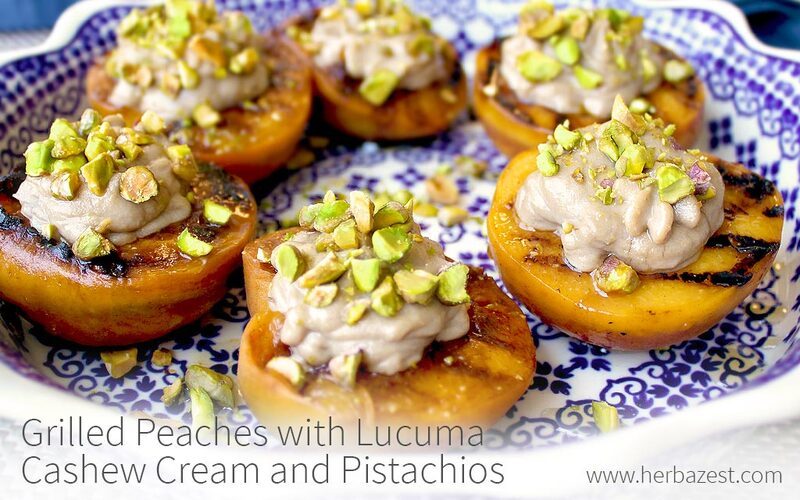 You can swap the peaches for nectarines or apricots, lucuma cashew cream for ricotta cheese or mascarpone, or pistachios for walnuts, pecans, or any other nuts.